Today, we profile the second out of six Indian startups vying to secure a semi-finalist spot at The Wall Street Journal's WSJDLive conference in Laguna Beach, California. The eight semi-finalists will have the opportunity to attend the three-day WSJDLive (October 19-21) and present their companies to an audience that will include Marc Benioff of Salesforce, Virginia Rometty of IBM, Bin Lin of Xiaomi, NSA Chief Admiral Michael Rogers, Tyra Banks of Fierce Capital, Kazuo Hirai of Sony, Elizabeth Holmes of Theranos, Stewart Butterfield of Slack, Robin Li of Baidu, Sergio Marchionne of Fiat Chrysler Automobiles N.V., Richard Plepler of HBO and investor Yuri Milner of DST Global. We started the series on August 24 with Guiddo, a video-based app alternative to static tourist guides. Urban parenting is no child's play, especially in a nuclear family. 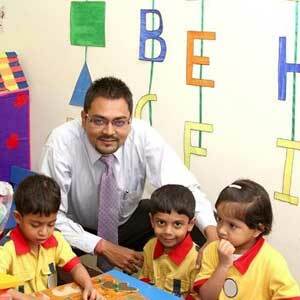 Nitin Pandey understood this well after interacting with parents in his previous role as sales head at KidZee, the major play-school chain. "I used to travel across major cities, and urban parents seem to have similar concerns everywhere as they lack support that traditionally comes in a joint family," says Pandey. "Most problems in a person's life can be fixed with a one-time solution. However, questions that crop up in a parent's life require sustained guidance." Gurgaon-based Parentune is a free online platform for parents to share concerns about children and compare notes with other parents. The portal also conducts question & answer sessions with experts (as a premium offering, for a nominal fee) while doling out advice columns, product reviews and videos. While some parents search for 'what to do if my toddler does not sleep at night', others comment on topics such as 'best organic foods for kids' or 'what to pack in the lunchbox'. Parentune claims to offer insights on everything ranging from kids behaviour to the best school. Its goal is simple: help parents with decision making. "You can compare us with Babycenter.com or BabyTree.com in China. However, we are different as we provide handholding support to the parent until the child becomes totally independent," said Pandey, who is also the CEO of Parentune. So, how does Parentune work? The company requires the parent to give a child's age and the topic they are interested in during registration. This ensures that a parent receives personalised and tailored content. Moreover, this has helped Parentune maintain a userbase that consists solely of parents and is free of spammers. Parentune's algorithms surf for relevant trends and topics depending on the parent's potential needs. Parentune's monetisation model is advertiser-centric. Since, the company maps both the parent and child's profile during registration, it can offer targeted advertising for brands. "The target consumer segment for a diaper brand would be parents of a one-year-old children. For the mother of a pre-teen, it will be more like nutrition supplements. It's a win-win situation for everybody and has worked for us well," said Pandey. How hopeful are you of winning? We are currently the largest, verified 'pro-parent' community in India. It's a community that provides quick and validated support for urban parents. I believe we have put together something which is valuable and scalable. This is what will make us a winner, I think. What do you think makes Parentune tick? Parentune is a decision-maker for parents, as it brings together personalised help, verified information and trusted advice, making it one of its kind. What do you hope to achieve if you are one of the finalists and get to represent your company at WSJDLive? We believe that in India, every other customer is a parent. So there is a large market that is lying untapped. This is the customer base that we are building our company for. And I believe if we get showcased on such a large platform, we will have the potential to scale up tremendously. Parentune claims to have nearly 300,000 unique monthly visitors and a verified user base of 130,000 parents. Pandey says that the startup is growing at 33-35 per cent every month. The average Parentune user spends about 11 minutes daily on the portal. The company also has a partnership with online marketplace Snapdeal.com for curating content for Snapdeal's children category. Parentune's content has also been featured on the Indian editions of magazines such as Good Housekeeping and Prevention. Despite Pandey's stated advantages of Parentune, it does operate in a highly competitive market. Its largest rival, Babycenter, enjoys top-of-mind awareness among young parents and also has customised features, such as online prayers and pre-natal classes for expecting mothers. Parentune also competes with the likes of BabyChakra, ZenParent, Parentedge, KIDSS (Kid Social Shell) and MyCity4Kids with a few of them raising outside funds. In June, Infomoko Technology Pvt Ltd, which owns and operates parenting tips child care services portal BabyChakra, raised an undisclosed amount of seed funding led by Mumbai Angels, Patni Family Office and Singapore Angel Network. Prior to that, ZenParent.in secured $500,000 (Rs 3.17 crore) from Bangalore-based i2india Venture Factory. The thirty five-year old Pandey is so confident about his idea that he has put his entire savings, of about Rs 40 lakh, in the three-year old venture, Proparent Solutions Pvt Ltd. He had raised an undisclosed amount in seed funding a few years ago. "The winner in the online segment will be a property that becomes indispensable to mothers; it remains to be seen whether Parentune can be the one," said Sunil Goyal, founder and CEO of YourNest Venture Fund, one of the early investors in Mycity4kids. "At this stage, what matters is traction and level of engagement. Such platforms actually enable cross-learning from within the parenting community. Monetising expert advice as a business model needs validation as scale may be compromised in the process." Pandey, who has also worked with Zee Learn and iDiscoveri Education, believes that the opportunity is large enough for existing players. About 200 million Indian parents are expected to own smartphones in the next two years, according to his research. Parentune has an ambitious target of getting 25 million such parents as users. "We will have 500,000 users in the next 45 days," notes Pandey, who is an alumnus of Indian Institute of Management, Bangalore. Parentune is trying to differentiate itself through offline events. Every year on Parents Day, the company organises workshops and meet-ups with parents and plans to conduct such events in 12 cities over the next few years. Currently, it conducts events in Mumbai and Delhi NCR. Over time, Pandey says there could be monthly, monetisable events such as workshops, talks and counselling services where parents pay a fee for participation. Parentune is also piloting a new feature that allows parents to access live-streaming videos from child care experts, nutritionists and counsellors globally. Also, it is set to launch a revamped version of its app called LiveChat, for the iOS and Android platform. The company says that 81 per cent of its current traffic already comes from mobile.